Our immersive helms will whisk your visitors back in time via the magic of cutting edge 3D sound. 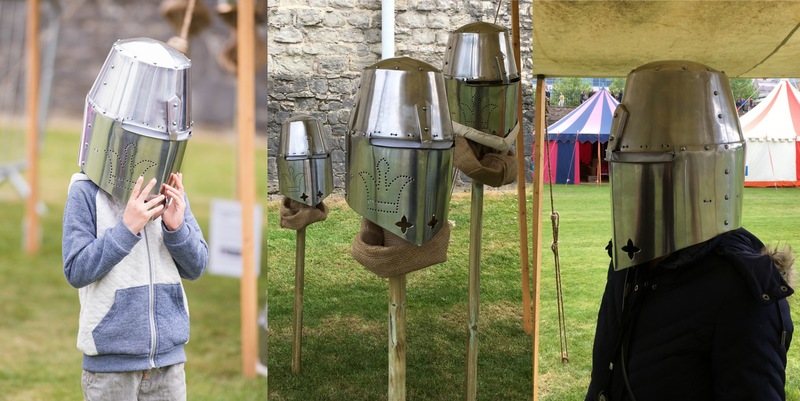 Specially adapted replicas of authentic historic headgear, our helms pitch the listener into the original wearer’s world as soon as they’re put on. A knight’s great helm transports the wearer into the heart of a medieval battle, with assailants waiting to strike. A gladiator’s helmet pitches the listener into Rome’s Colosseum, surrounded by the cacophony of the baying mob. A WW1 helmet and gas mask will sink the listener ankle-deep into trench mud with the sound of shellfire exploding all around them. As soon as they lift the helmet off, they’re jolted back to the real world – with just a few goosebumps to remind them of their lucky escape. Our Immersive Knight’s Helms in action at the Go Medieval Festival at the Tower of London. Image used courtesy of Historic Royal Palaces. Fully automatic and battery-powered, the helms require no staff to operate them and can operate all day on a single charge. They come with 3D audio built-in but we can produce bespoke tracks, and bespoke helms, to fit the specific story and theme of your museum or attraction on request. The helms are ideal as handling objects, with a magical surprise inside, or can be used to take dressing up to an entirely new level! Suitable for children as well as adults, they can also be used to add a new dimension to your educational programme. I thought I was going to get my head sliced off! It’s like you’re really there! You can really feel stuff happening behind you and around you. Visitor reactions to our immersive knight’s helms. We can also pair them with geolocation technology to automatically trigger sound as the wearer moves around your attraction. So, for example, a visitor could don medieval headgear and ‘hear’ your castle as it was over 1,000 years ago, or be immersed in a specific event such as a siege, with the sounds changing as they explore. The 3D sound is so effective at triggering the imagination, your visitors will really feel as if they’ve stepped back in time. Available for purchase or lease, you can find out more about our immersive helms and request a demonstration by emailing us or calling us on 01242 256970.